I just returned from three weeks in Italy and Austria, and I hoped to do lots of biking, but a recent back surgery and scorching hot weather cut biking to just three days. However, they were a great three days, so here is the first report. 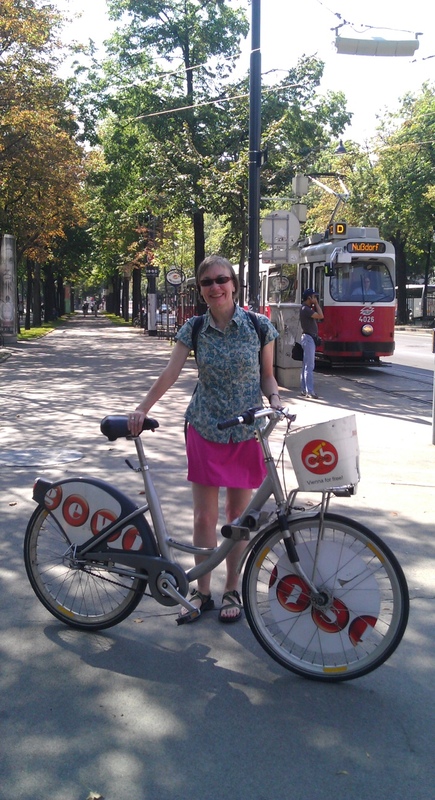 One morning in Vienna, my husband, Steve, and I rented bikes through Vienna’s bike share program, City Bike Vienna. Every train and tram stop has a rack of bikes ready to ride. 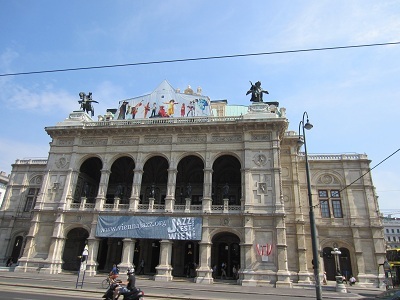 We took the tram to a stop directly across from the gorgeous Vienna Opera House and found that to be able to use a bike, each individual must have his or her own account and needs to use a different credit card. This can be done ahead online, but it only took a couple of minutes on the computer at the stop, which had an English language option. Once I had an account, I logged in, put in the number of the bike I wanted to ride, and was ready to go. The bikes were very well maintained, colorful, had great bells and baskets, and weighed a ton! 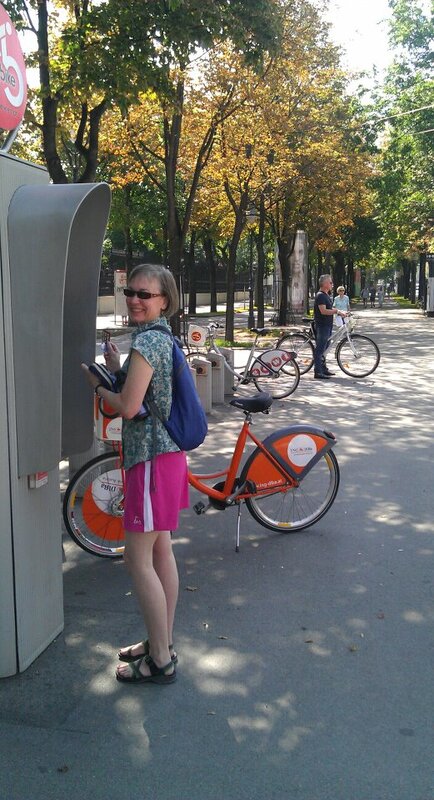 Betsy rents a bike at the quick and easy kiosk system of City Bike Vienna. Due to my aforementioned surgery, I was not supposed to pick up anything over twenty pounds. I think the bike weighed about as much as I, so Steve pulled the bike from the rack for me and made sure it was steady before I got on. Also due to the surgery I hadn’t biked for six weeks, thus was euphoric to be cycling. I had a death grip on the bike when we began our ride in the center of traffic, tourists, and trams, but found the bike lanes to be delightful. Steve led the way, and the routes, signs, and ramps worked great. We pulled over to take photos and see sights along the way and weaved our way through the west side of the Ringstrasse, which circles the old town of Vienna. We rode out and back a few miles and then cycled on the other side of the Ring past the huge, glorious Viennese buildings. On this east side of the ring, the crowds were plentiful, and while bike and walking lanes were well-marked, they also often switched sides. Once I ended up on a pedestrian side with no ramp when I came to an intersection. Steve had to rescue me by lifting the 1,000-pound bike up the curb. When we returned the bikes to the station where we began, the process was simple to return the bike: log in, insert the bike in a space, and make sure the number shows up on the terminal. Betsy with her cute-but-heavy rental bike in Vienna. If I were planning to ride a lot in Vienna, I would probably rent a bike from a store to have it fitted and to get a lighter bike. However, for a couple hours of sightseeing, City Bike was perfect. It costs one euro to register and the first hour is free. The second hour is one euro, third is two euros, fourth and beyond is four euros. So while our two-hour ride was a great value at two euros, a day of biking would be comparable to a rental. We spent countless hours walking through towns on our trip, which was delightful, but to see a larger area and become part of traffic and the life of those working and living in a town, cycling in Vienna was even more delightful. 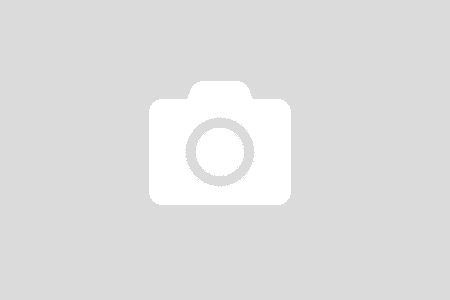 Have you biked in other countries? How did the experience compare to your usual biking? Have you used a bike share system, and if so, how did that work for you?